The LiftRight Wheel Lifter makes it easier, faster and safer to lift and move tyres and wheels. 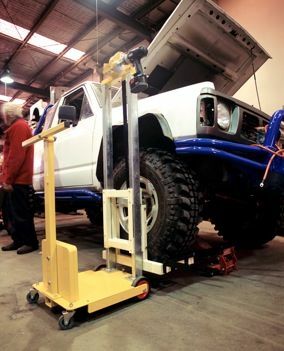 It takes the heavy lifting out of the process of removing or fitting wheels to a vehicle as it has been specifically configured to lift wheels on and off vehicles and it can also lift a wheel onto a wheel balancer. 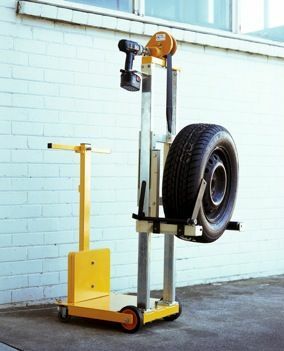 With the average weight of a 4 wheel-drive wheel being almost 40kg, the Wheel Lifter is an excellent solution to workplace safety for lifting wheels on and off vehicles, and onto a wheel balancer. The Wheel Lifter can be used on passenger vehicles, light commercials and 4 wheel-drives. requires minimal staff training for it to be incorporated into existing work practices, is easy to operate and user friendly.